What does the Quran teach us about dua? Apparently it’s not as simple as asking for a favour. 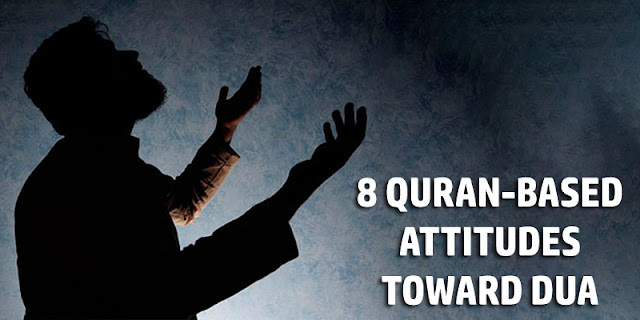 The Message assumes that we approach dua with certain necessary attitudes— and that we leave it positively transformed. Let’s take a brief survey. 1) Speak Only to the One Who Will Answer. It’s difficult for we mere humans to grasp, but the idols that we can see and touch are powerless to aid us, whereas the one who responds to our supplications can’t be physically sensed. Remain true to tawheed and remember that nothing is comparable to Allah (swt). 2) Be Hopeful, Reverent, Humble, and Submissive. 3) Make Dua Continuously— Not Just When You’re in Trouble. Allah demands constant contact with you; He’s not to be forgotten once He’s granted your request. 4) Honour Others Who Make Dua. Those who appeal to Allah on a regular basis form a kind of family. Your family. Don’t ignore them! 5) Rest Firm in Your Belief. As we showed in this article, prayer and zakah form a strong partnership! 7) Be Patient— the Answer Doesn’t Always Arrive Quickly, or in the Form You Demanded. 8) When He Grants Your Request, Respond With Greater Righteousness. Knowing that The Compassionate responded to your prayer should result in a profound gratitude and increased efforts to live your life in a way that pleases Him. May your life be lived in such a way as to make your dua acceptable to the only one who’ll respond with an infinite love. Ameen.